What an ending to an amazing season! 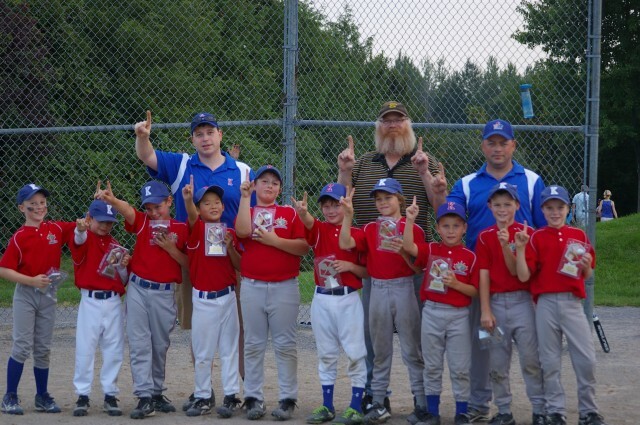 The Rookie A Cubs and the South Ottawa Blues met 4 times over the course of a 20 game summer season. The wins were split 2 games apiece. Those 2 losses were the only losses experienced by the Rookie A Cubs all summer. The City Championship was 5th meeting of the district's top 2 teams and the season-series rubber-match. The Cubs gave up 5 runs in the top of the 1st inning and looked like they were feeling the pressure of a championship game. But they came back with 5 runs of their own as the bats lit up in the bottom of the 1st. The defense steadied and the Cubs held the Blues to just 4 more runs over the next 4 innings. The bats kept working as they have all season and the Cubs put another 10 runs on the board to make the final 15-9 after 5 innings, winning the City Championship.